If you live in Wisconsin, try contacting the Polish Center of Wisconsin, the Polish Heritage Club of Madison, or other local Polish heritage groups. (Similar groups in other parts of the country can probably also provide information.) 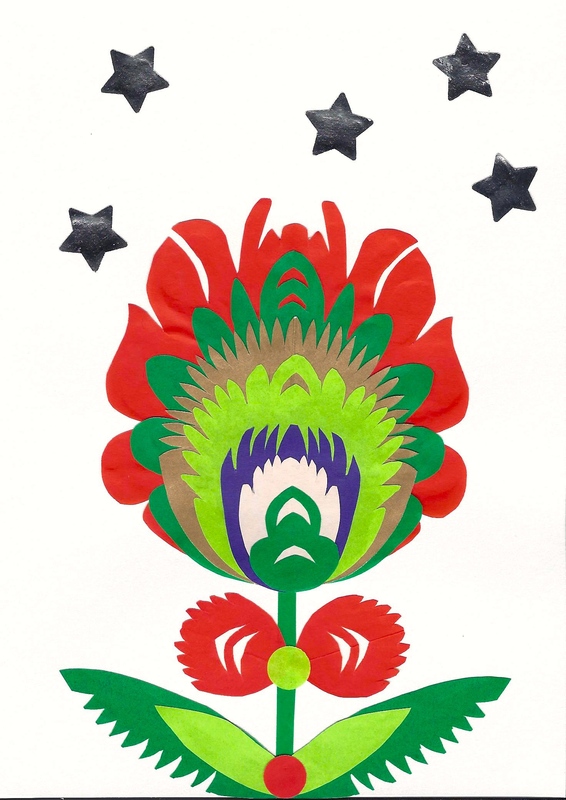 I’ve taken several workshops with Kasia Drake-Hames. Kasia (in the tan sweater) holds workshops and classes that are low-key and fun, most often in the Milwaukee area. My very first wycinanki project. Yes, it is just like making snowflakes. 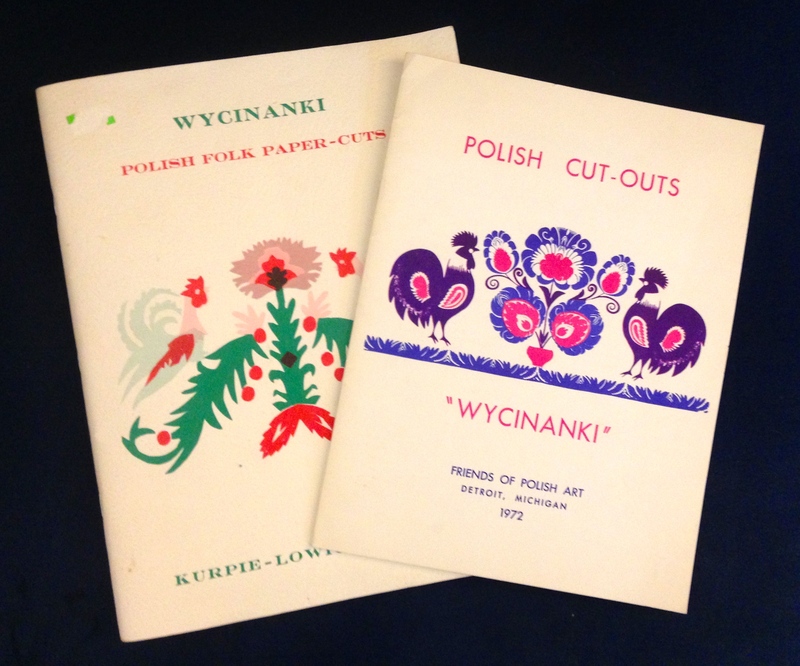 I took a class on wycinanki Christmas cards at the Polish Center of Wisconsin. If you can’t find a class, don’t despair. It’s easy (and inexpensive) to get started. 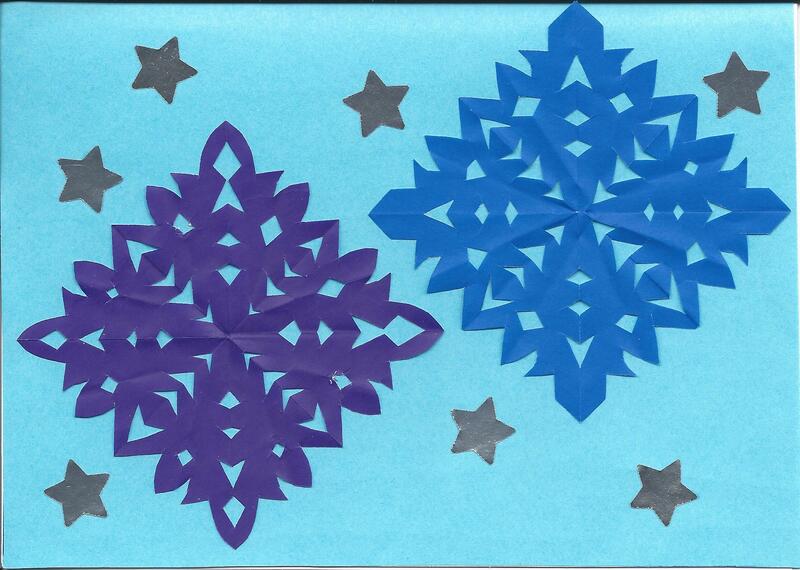 Materials needed: paper (I use origami paper), scissors, glue. 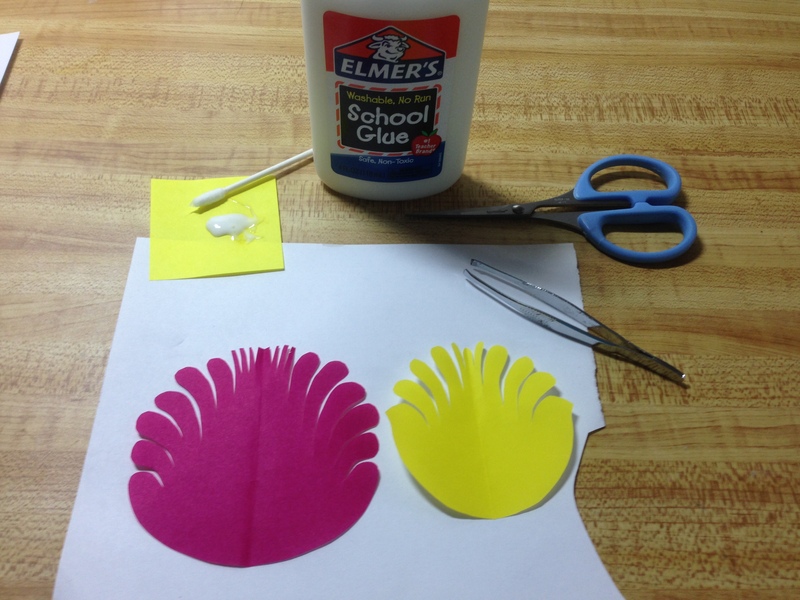 Tweezers can be helpful for placing pieces, and Q-tips work well to spread glue. 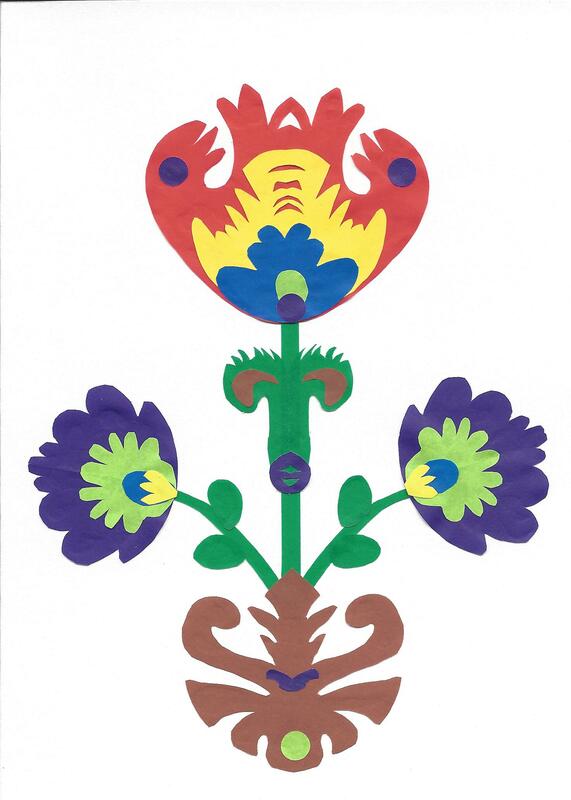 I wanted to feature symmetrical flowers from central Poland’s Łowicz region in Tradition of Deceit, and I’ve learned a lot about this type of wycinanki on my own. 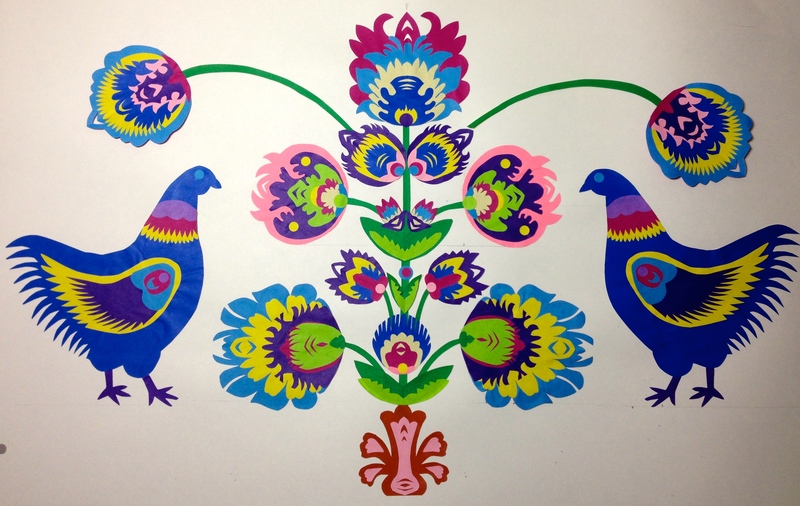 Ornate flowers are made by layering different colors of paper. After gluing, I put the flowers between sheets of waxed paper and press them under heavy books. This keeps the flowers from curling as the glue sets. When you’re starting out, it’s easiest to use printed patterns. I’ve found posts at Papermatrix particularly helpful. I also picked up a couple of vintage books. After you’ve used someone else’s patterns for practice, it’s pretty easy to start experimenting with your own. Google wycinanki, study examples, and see what appeals to you. 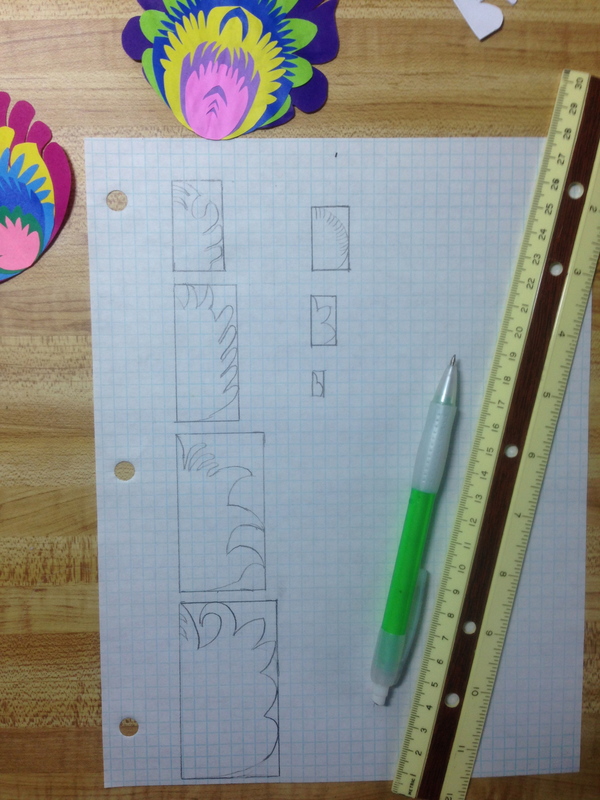 When I design my own flowers, I use graph paper to help keep the diminishing sizes in order. 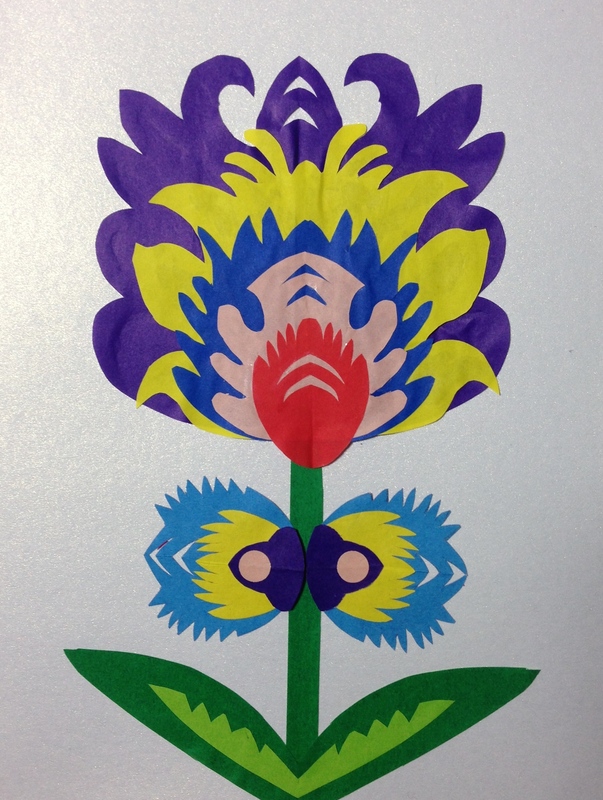 Patterns show half of a flower layer. 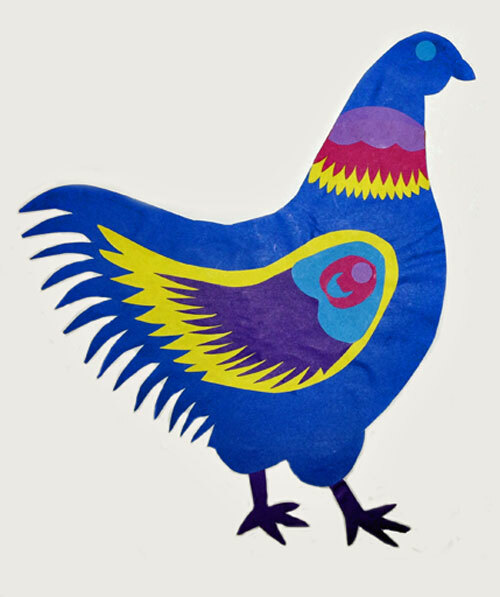 Fold the origami paper in half, place the pattern against the fold, and trace around the pattern. (Trace on the back side, so any pencil marks that remain after cutting don’t show.) Use the fold line to help you align each new layer right in the center of the one below. I started small by making simple wycinanki cards. 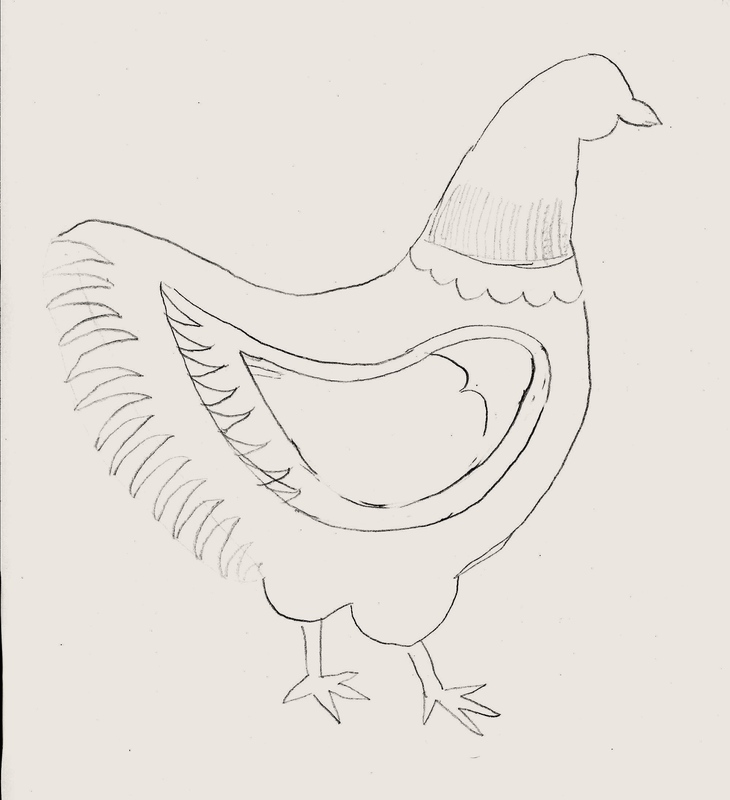 Roosters are very common, but I needed to create my own chicken pattern. I started by making a simple drawing, and then sketched in layers. Then I transferred the layers to origami paper. You can see how some of the details evolved. That’s OK, though. I started with a very simple flower bouquet, but kept wanting to add more blossoms. Then I decided that the open space above and below the chickens needed to filled. The two flowers above the chickens haven’t been glued down yet because I’m still playing with ideas. I’ve had a lot of fun with wycinanki, and if you’re so inclined, I hope you do to. And if you do try it, I’d love to see the results!